Air Purifier D-850 Features: 1. Cold Catalyst Filter in D-850 Air Purifier provides a catalyst effect in your living environment to make your air safe - Removes harmful gases and decomposes them into water and safe carbon dioxide - Extremely long lasting and can be valid up to 5 years - Non-toxic, non-corrosive and non-flammable. - Safely destroys formaldehyde, ammonia, benzene, TVOC, hydrogen sulfide and other dangerous gases released by plywood, furniture, wallpapers, carpets, curtains and bedspreads 2. Cellular Activated Carbon Filter in Air Purifier makes your air clean by utilizing high absorption and dust collection characteristics 3. AntiMicrobial Filter in Air Purifier is a 5 micron filter with antimicrobial agents efficiently eliminates bacteria making air safe 4. High Efficiency HEPA Filter in Air Purifier eliminates 99.97% of airborne particles larger than 0.1 micron. 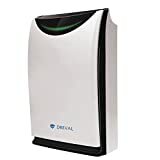 Bacteria, pollen, ragweed and other allergens, mold spores, dust mites, fungi, viruses, germs, pet dander, cigarette smoke and other small particles are captured by the HEPA filter 5. Negative Ion (anion) Generator generates a large amount of anions and makes the oxygen negatively charged, thus gathering the positively charged particles like floating dust, bacteria, viruses and smoke. The particles become denser and sink to the ground making the air clean and safe. The smaller the particle size, the higher the capture rate. 6. UV Sterilize 245nm ultraviolet lamp which kills a variety of bacterias.The UV lamp is used to purify the air and it is able to eliminate odor caused by smoke and mold. It produces a great amount of negative ions, which freshens the air while avoiding the spread of viruses. 7. Built in Humidifier can be used in a dry weather to increase the air humidity, effectively remove odor caused by smoke and mold, moisturize the skin. 8. Intelligent Odor Sensor System can automatically adjust the fan speed. 9. Air Purifier is equipped with a Remote Control for your convenience.